KLA-Tencor (KT) has been a leader in process control for the semiconductor and related industries for 40 years, developing and manufacturing inspection, metrology and data analysis systems that rely on innovative optics, sensors and high performance computing technologies. KT’s Corporate Procurement division focuses on globally strengthening KT’s competitive advantage through optimizing supply chain innovation, reliability, effectiveness and efficiency. I came across KT during my first year at Rady. The University Relations team at KT reached out informing me that they received my resume from Rady and asked if I was interested in applying for their supply chain summer internship. After a couple interviews with my Manager, Kirk Maloney, I knew KT would be a great place to be. I then received and accepted an offer to intern. During my internship I worked on a “Corporate Procurement Re-engineering” project. I conducted market research and analysis, recreated the departments UI/UX, and conducted analysis on a workforce initiative. During this project, I was able to implement many skills and knowledge gained during courses such as: Operations, Lab to Market, and Finance. Toward the end of the internship, I received a fulltime job offer from Kirk and the Head of Procurement, John Proverbs, for upon graduation. Now a year later, I’m working as a Supply Chain Specialist focusing on KT’s implementation of a global Contracts Lifecycle Management solution. With this project, I’ve been able to implement many of the skills acquired during Rady’s Project Management and Costs in Supply Chain Management courses. As I progress in my career, I look forward to further development at KT and implementing the knowledge acquired during my time in San Diego and Rady. My experience with KT was a very interesting one. I haven’t previously thought about a supply chain position, but the passion of the Supply Chain professors I met, such as Anklesaria and Shin, really drove my interest in the supply chain field. I originally applied for the KT supply chain internship program back in December, through Careers Rady. 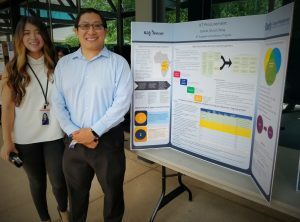 I hadn’t heard back; but, I noticed that the contact for the internship happened to be with one of the second year students, Jessica Bonilla. I then took the initiative to reach out to her and set up an informational interview. After speaking with Jessica, I learned a lot about KT and her experience there as an intern, which increased my interest with the company. Afterwards, I received a request for a phone interview, and after a few rounds I received a supply chain internship offer from my manager, Scott Bostic. During my internship I worked on a Conflict Minerals Expansion Project. This entailed a thorough review of KT’s current process, improvements, and expansion of the program. This project utilized my background as an analyst as well as important lessons learned through the core Rady curriculum. As I prepare for my second year at Rady, I am hopeful that I will be part of the Israel Immersion course (which Jessica spoke very highly of) as there is a large tech and startup culture there. I hope to bring back my experience to share with my fellow cohort and the incoming MBA cohort, and further my knowledge in supply chain and business.